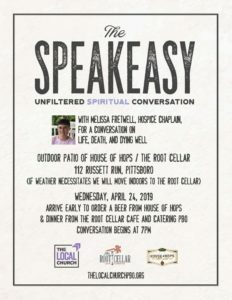 The Speakeasy Unfiltered Spiritual Conversation House of Hops/ The Root Cellar 112 Russett Run, Pittsboro Wednesday, January 30 Gather and Mingle 6:15-7 PM Conversation 7-8PM This Month: A conversation on life, death, and dying well by Melissa Fretwell, Hospice Chaplain. 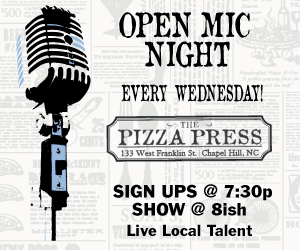 Come and display your talent or just sit back and enjoy the entertainment every Wed night at The Pizza Press Chapel Hill. Great food and drink specials. Over 25 local Craft Beers on Draft. Come and support local talent here in Chapel Hill. See the rest of our daily specials! 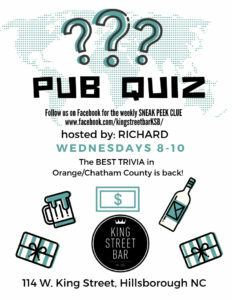 Richard Fitzpatrick hosts his award winning pub quiz and trivia at King Street Bar every Wednesday. Think you can match wits with him? 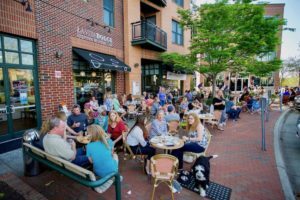 Come try every Wednesday, for free from 8-10pm! Follow King Street Bar on Facebook for the weekly sneak peak clue!